❤️ WHILE LOCKET NECKLACES THAT HOLDS PICTURES LOOK VERY SIMILAR IN PHOTOS there is a world of difference: many BREAK, TARNISH & turn BLACK, TURN YOUR SKIN GREEN and LOOK CHEAP. 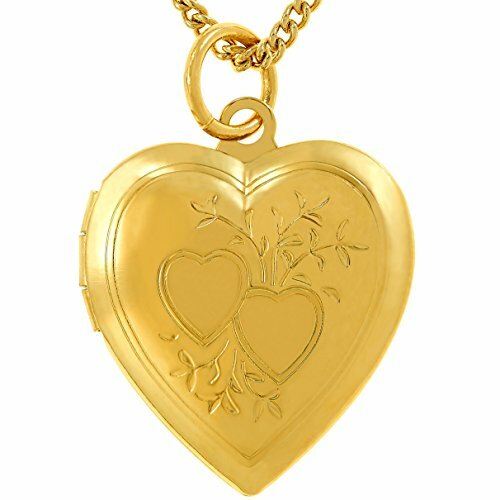 Our Lifetime Jewelry premium heart locket necklace HAVE 20 TIMES MORE 24K GOLD PLATING than others, is STRONGER and WILL LAST YOU ALWAYS. You will BUY IT ONCE and wear it for a lifetime or we'll REPLACE IT FREE OF CHARGE. 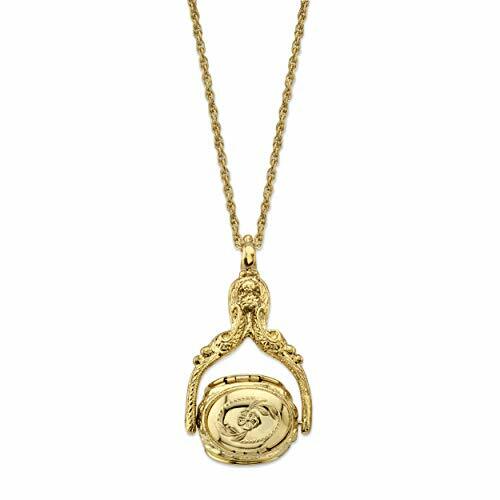 &#x1F49B; LOOKS AND FEELS LIKE AN EXPENSIVE SOLID GOLD LOCKET BUT IS MUCH STRONGER due to our semi-precious metal core. 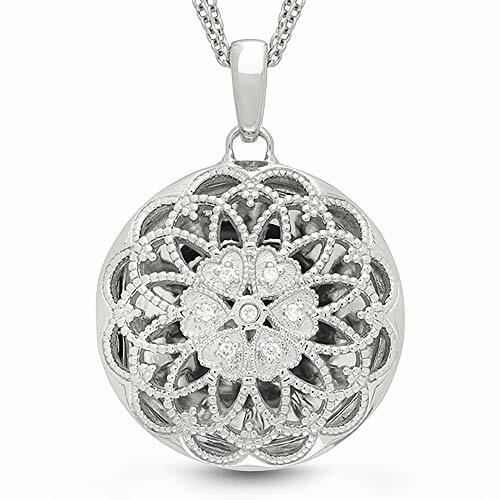 Wear this cherished pendant with confidence, as ONLY YOUR JEWELER WILL KNOW THIS IS NOT SOLID GOLD. 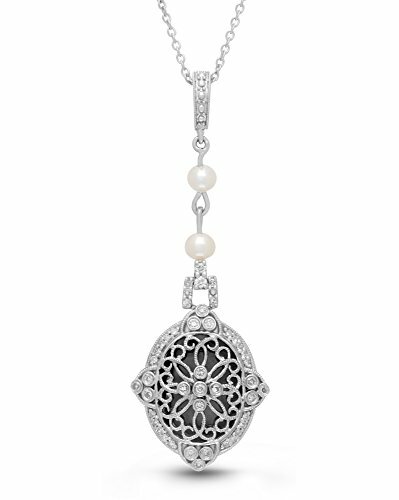 The preferred jewelry for women, girls and kids alike, our locket's necklace chain have QUALITY CLASP THAT STAY CLOSED and DON'T CATCH YOUR HAIR. &#x1F49C; NO NEED TO SPEND A FORTUNE FOR AN ELEGANT LOOK. 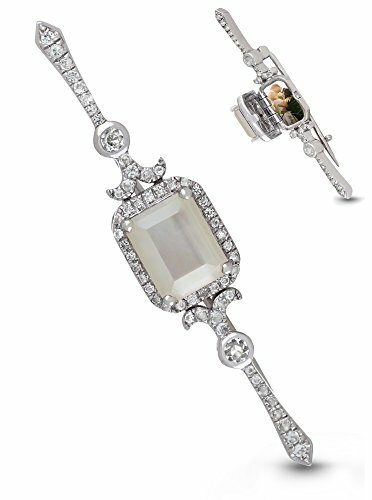 Whether looking for GIFTS FOR WOMEN or KIDS JEWELRY FOR GIRLS, look no further than our Lifetime Jewelry. Our chain size is 18 inches. 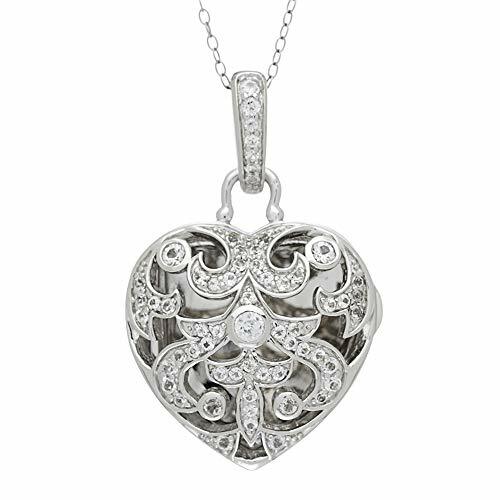 &#x1F49A; WE PROMISE LIFETIME REPLACEMENT OF ALL OF OUR Lifetime Jewelry heart lockets - FREE OF CHARGE. 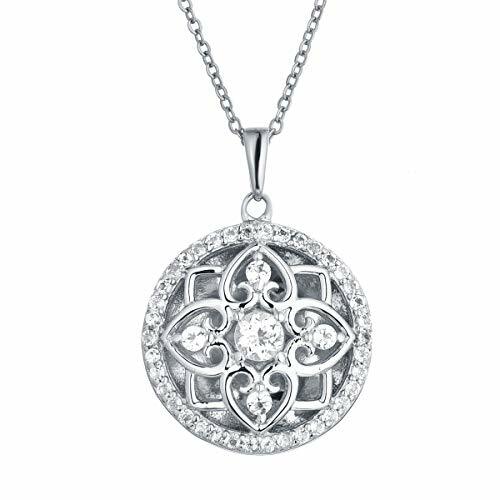 If it ever BREAKS, TARNISHES or simply doesn't live up to your highest expectations, we will replace your gold locket with a new one FOR AS LONG AS YOU OWN IT. We mean it when we say BUY IT ONCE and WEAR IT FOR A LIFETIME. &#x1F499; AT LIFETIME JEWELRY OUR GOAL IS TO PROVIDE JEWELRY THAT LOOKS AND FEELS LIKE SOLID GOLD AT A FRACTION OF THE COST. For over 30 years our family-run small business has stood for INTEGRITY, proudly creating jewelry "Made in the USA" with the HIGHEST QUALITY CRAFTSMANSHIP, MATERIALS AND CUSTOMER SUPPORT. We expect the best for our family so we give the best to yours. 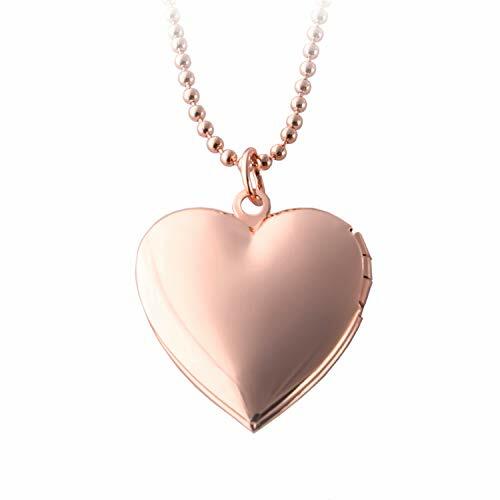 ★About Locket★ The Locket is a pendant that opens to reveal a space used for storing a photograph.This heart-shaped Locket Necklace,includes two inner photo windows,could take 2 photos.Highly polished surface,the color of rose gold makes the locket look beautiful and charming. 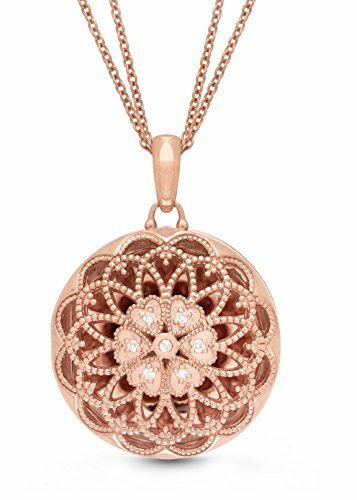 ★Material+Quantity+Size★Copper plated Rose Gold pendant locket (0.98inch*0.91inch)*1,copper plated Rose Gold necklace bead chain (18inch)*1, Nickel and lead free.Silver cloth*1. ★Ideal Gift★for Christmas Day, Valentine's Day,Mothers Day, Birthdays, Anniversaries, Anything for Anyone you loved. ★Fully Refundable★: in the (very) unlikely event that you aren't satisfied, simply return for a 100% refund! We promise superior service which includes fast shipping, great communication.Look forward to your 5 star review. ★Warming Tips: ★The jewelry will say the things you want to say and for Love,beauty and life,so keep the locket necklace clean is very important,please wipe the jewelry with the silver cloth we sent, after touching the jewelry with your hands,avoid exposure to cleaning agents, beauty products & water. Store it in a cool, dry place and put it in the jewelry bag when you don't wear. 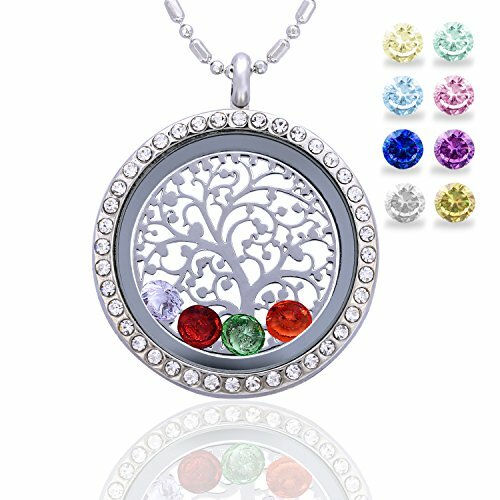 ♥Complete gift Set♥ - Secure magnetic seal floating locket with a birthstone crystal embedded finish + 2 family tree of life plate + full set of 24pcs birthstone charms (12 month each month 2pcs total 24pcs), shiny rhinestones surface and high polish creates glamorous reflections and adds a luxurious look to this necklace. 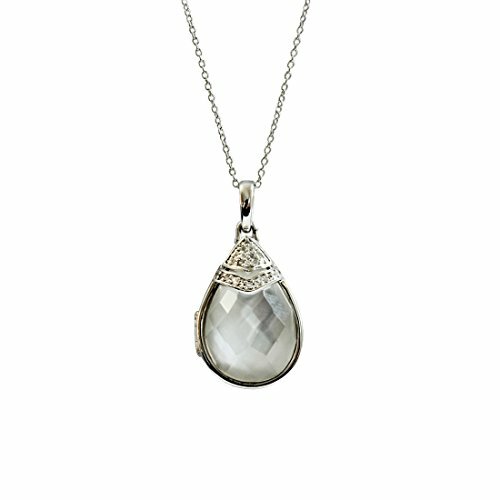 clear glass double side face locket opens to add charms of your choice. all in an elegant jewelry box, perfect for gift giving. ♥Design concept♥ - This glass locket opens from the side like a notebook, and has a very strong magnetic open/closure with a pin, so you don't have to ever worry about losing any of your treasured pieces. This also allows you to be able to open it up and add more charms, or switch out the pieces for a new look each day! 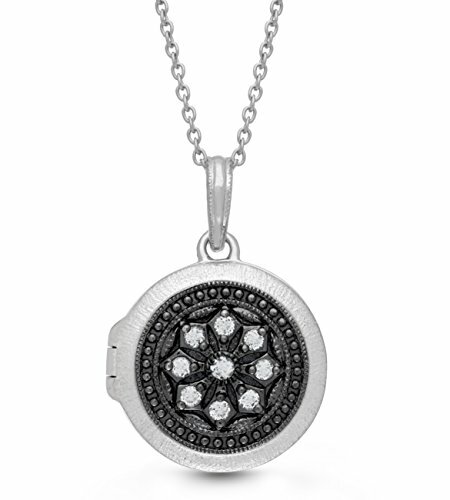 Charms and disc will move around when worn, this is the nature of a floating locket. 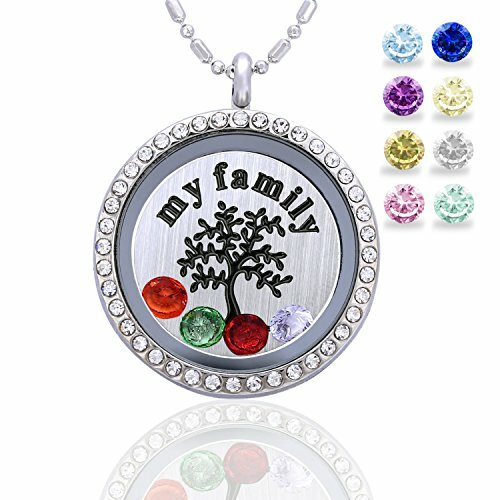 ♥Inheritance of love♥ This famliy tree of life birthstone necklace design with "tree of life" & "birthstone" congregation. that is a special gift for your mom, grandma, mother-in-law, daughter, wife or nana, "tree of life" means life's endless and power, family person always get together in the whole tree. "birthstone" means your family person birthday month, remember every important moment and lucky time. Perfect gifts on mother's day! birthday necklace gifts for all important family person. ♥Specification♥ -Floating locket pendant sizes: 30mm *30mm * 7mm, Diameter: 30mm, Inner diameter: 23mm, come with a 55cm/22" bead chain + 5cm/2" adjustable chain. since the lockets are closed by magnets, all you have to do is pop open the locket and fix the charms. 316L stainless steel, Nature stainless steel color, Non plating, Non allergic, Non fade, Washable, Magnetic closure, Tempered glass. YOUR STORIES BUILD OUR LEGACY -Every Piece, a Story. Our company is founded on stories of loved ones. Stories evolve, but the messages live on. 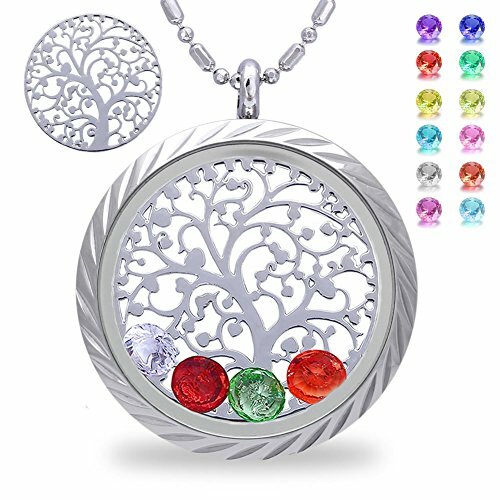 Best Gifts - The family tree of life with owl birthstone design, symbolizes the cycle of life, which represents the love and connection between our families and ourselves. "Birthstone" means your family person birthday month, remember every important moment and lucky time. Tassel stands for fashion. Perfect gifts on mother's day! Birthday necklace gifts for all important family person. It is a special gift for your mom, grandma, mother-in-law, daughter, nana. 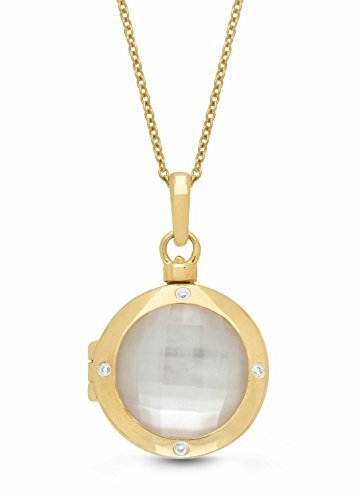 Easy to Open the Locket - This glass locket opens from the side like a book, Easy to open/closure, and has a very strong magnetic, so you don't have to ever worry about losing any of your birthstones. This also allows you to be able to open it up and add more charms, or switch out the pieces for a new look each day! 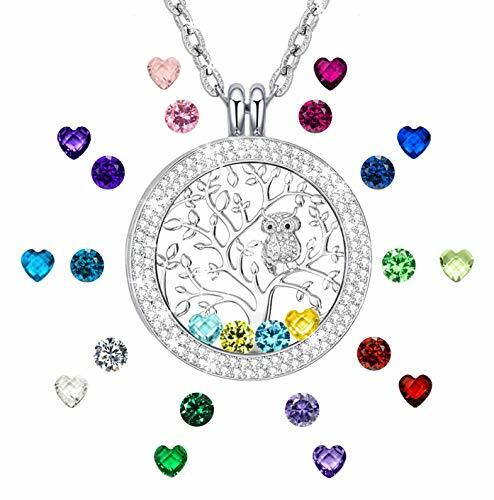 Unconventional Design - Secure magnetic seal floating locket with 24 pcs (2 sets ) birthstone crystal, the tree of life with an owl, the shiny rhinestones surface, I love you to the moon and back， chic hanging curb tassels which can be taken off. Besides, you can put small decorations like charms, photos or beads at any time when opening it. In a word, interesting DIY design. Size & Material-Our Pendant Necklace's Chain length 27.6 inch + 2.76 inch Extender with a snake chain and lobster clasp closure; pendant size:1.3 inch; Created Birthstone crystal : 5mm. Made of Alloy, 100% Handmade , Lead Free, Nickel Free Eco-friend Alloy, It will never fade and is not allergy for your skin, suitable for sensitive skins, no harm to health. Service guarantee-We strive to provide good item and service for all our customers, If you receive a broken item, birthstones are missing, or have any questions, please be free to contact us, we will free replacement a new one or full refund to you. We just want to offer a 100% satisfaction for our customer. 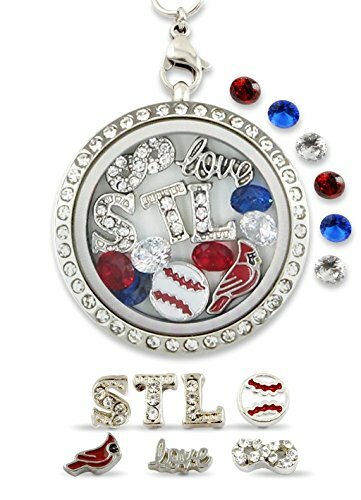 Unconventional Design - Secure magnetic seal floating locket with 24 pcs (2 sets ) birthstone crystal, the tree of life with an owl, the shiny rhinestones surface, I love you to the moon and back chic hanging curb tassels which can be taken off. Besides, you can put small decorations like charms, photos or beads at any time when opening it. In a word, interesting DIY design. Size & Material-Our Pendant Necklace's Chain length 27.6 inch + 2.76 inch Extender with a snake chain and lobster clasp closure; pendant size:1.3 inch Created Birthstone crystal : 5mm. Made of Alloy, 100% Handmade , Lead Free, Nickel Free Eco-friend Alloy, It will never fade and is not allergy for your skin, suitable for sensitive skins, no harm to health. 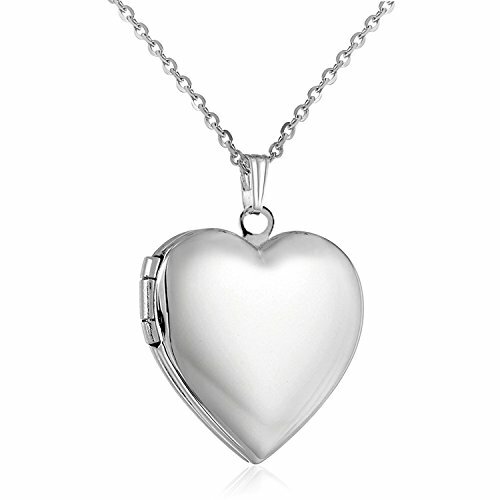 ❤<b>MATERIALS</b>❤: Polished love heart locket, made with Stainless Steel,antiallergic and no harm to health.Platinum Plated,keep the color not easy to fade. 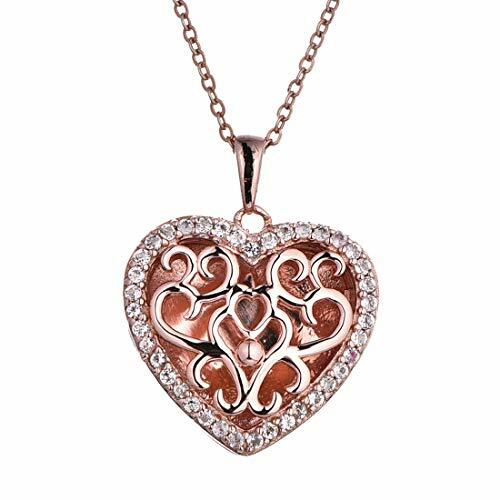 ❤<b>SIZES</b>❤: Love heart locket necklace pendant with chain length:45cm/18" + 5cm/2".Weight:5g. 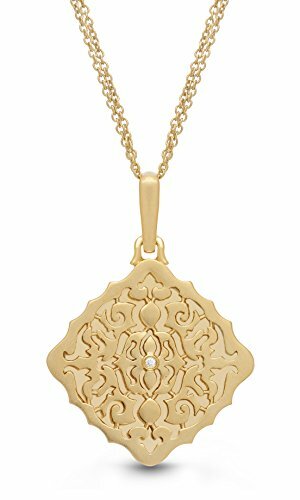 ❤<b>EXQUISITE CRAFT</b>❤: Love heart Locket necklace pendant for Mom Wife Girlfriend,fit every women girl and kids,packaged in a purple velvet drawstring bag for easy gift-giving. ❤<b>DESIGN CONCEPT</b>❤: Platinum Plated creates glamorous reflections and adds a luxurious look to this necklace. ❤<b>Seller Warranty</b>❤: 90-Day Money Back Guarantee or Exchange,and if you have any question, please be free to contact us! Unique Design - Secure magnetic seal floating locket with 24 pcs (2 sets ) birthstone crystal, the tree of life, the Double shiny rhinestones surface, Engraved 'I love you to the moon and back' on the back of memory locket. 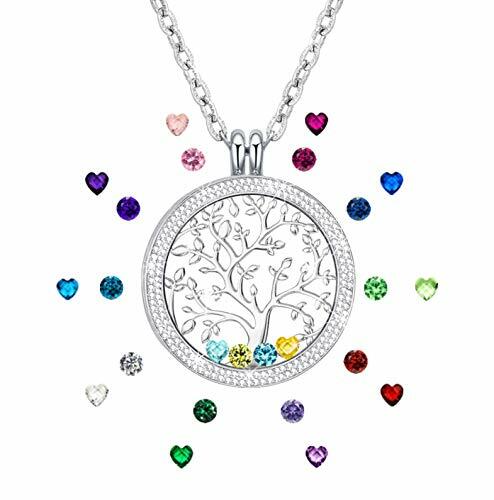 Perfect for Gift Giving - The family tree of life birthstone design, symbolizes the cycle of life, which represents the love and connection between our families and ourselves. Perfect gifts on mother's day! Birthday necklace gifts for all important family person. It is a special gift for your mom, grandma, mother-in-law, daughter, wife or nana. Easy to Open the Locket - This glass locket opens from the side like a book, Easy to open/ closure, and has a very strong magnetic, so you don't have to ever worry about losing any of your birthstones. This also allows you to be able to open it up and add more charms, or switch out the pieces for a DIY new look each day! Size & Material-Our Pendant Necklace's Chain length 21.65 inches + 2-inch Extender with a snake chain and lobster clasp closure; pendant size:1.3 inches; birthstone crystal: 5mm. Lead-Free, Nickel Free Eco-friend Alloy, It will never fade and is not the allergy for your skin, suitable for sensitive skins, no harm to health. Service guarantee-We strives to provide good item and service for all our customers, If you receive a broken item or have any questions, please be free to contact us, we will free replacement a new one or full refund to you.We offer a 100% satisfaction guarantee because of the customer first. 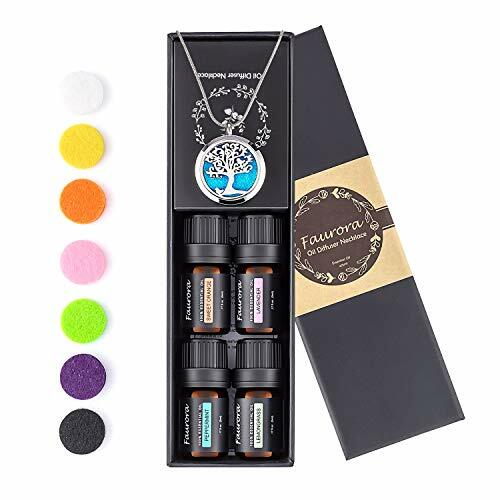 【Great Gift Set】An essential oil necklace with 27.6'' chain, 4 essential oils(5ml), 8 washable pads all in one, best gifts for women mom yourself or your families, friends. 【Premium Aroma Oils】 All oils are 100% certified pure no additives, fillers, bases or carriers added, included: Lavender, Lemongrass, Peppermint and Sweet Orange. 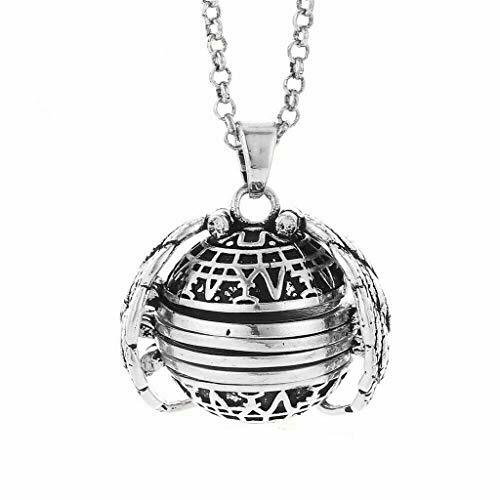 【Quality Materials】 The diffuser locket pendent and 27.6-inches chain are both made from stainless steel, sturdy and lightweight. 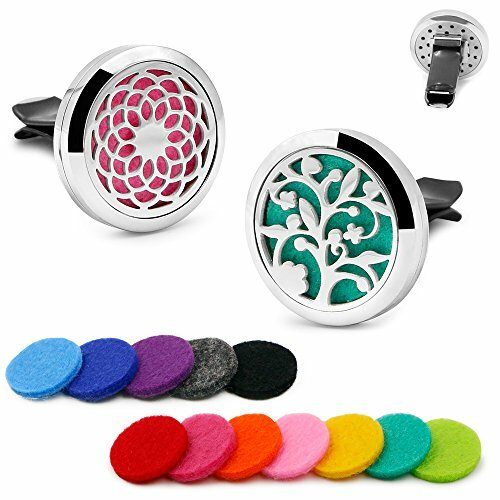 【Perfect Design】The 1.2'' diameter lockets with 2 magnetic closures closes tightly, you don't have to worry about getting oil on your clothes or skin. The chain is adjustable, so you can personalise the necklace according to your taste. 【Best Guarantee】 If you have any quality problems or complaints within 12 months after you purchased, please feel free to contact us and we will give you a perfect solution within 24h. ❤<b>MATERIALS</b>❤: Polished love heart locket, made with Stainless Steel,antiallergic and no harm to health.Platinum Plated,keep the color not easy to fade. 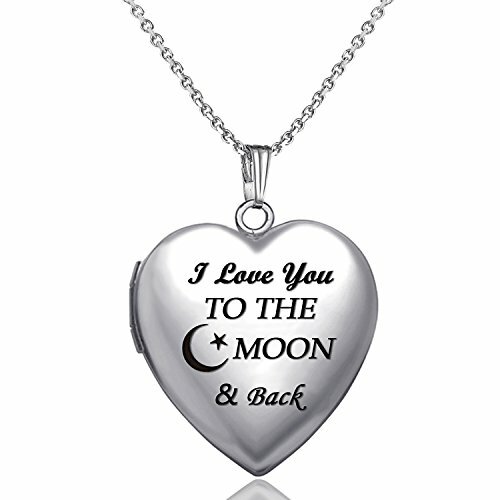 Engraved " I love you to the moon and back ". 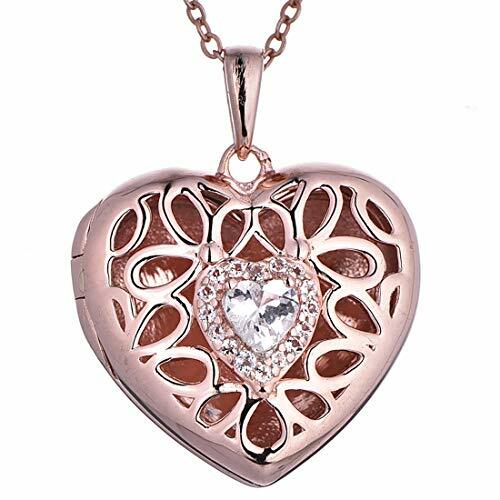 ❤<b>SIZES</b>❤: Love heart locket necklace pendant with chain length:45cm/18" + 5cm/2".Weight:9g. &#x1F9E1; WHILE LOCKET NECKLACES THAT HOLDS PICTURES LOOK VERY SIMILAR IN PHOTOS there is a world of difference: many BREAK, TARNISH & turn BLACK, TURN YOUR SKIN GREEN and LOOK CHEAP. 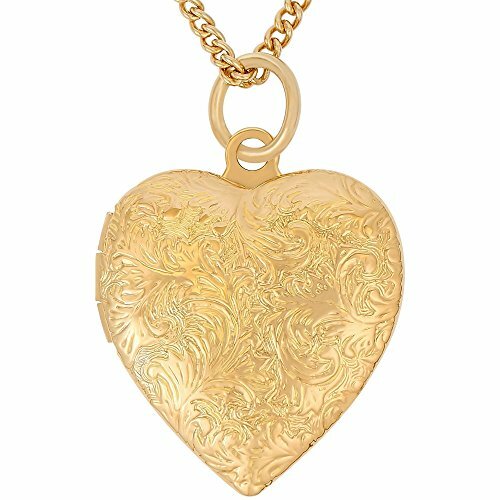 Our Lifetime Jewelry premium heart locket necklace HAVE 20 TIMES MORE 24K GOLD PLATING than others, is STRONGER and WILL LAST YOU ALWAYS. You will BUY IT ONCE and wear it for a lifetime or we'll REPLACE IT FREE OF CHARGE. &#x1F9E1; NO NEED TO SPEND A FORTUNE FOR AN ELEGANT LOOK. Whether looking for GIFTS FOR WOMEN or KIDS JEWELRY FOR GIRLS, look no further than our Lifetime Jewelry. Our chain size is 18 inches. 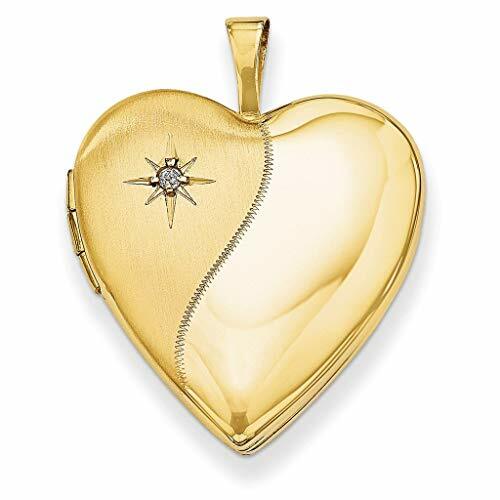 &#x1F49B; WE PROMISE LIFETIME REPLACEMENT OF ALL OF OUR Lifetime Jewelry heart lockets - FREE OF CHARGE. 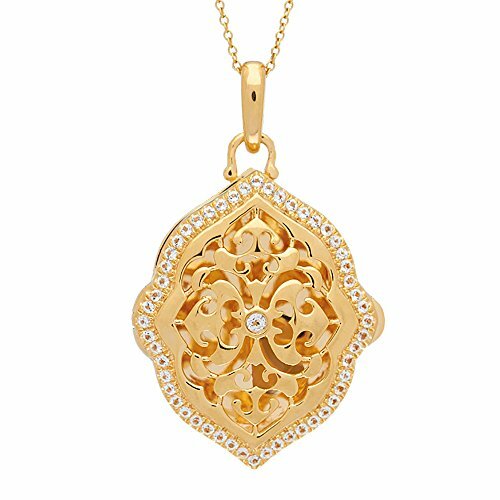 If it ever BREAKS, TARNISHES or simply doesn't live up to your highest expectations, we will replace your gold locket with a new one FOR AS LONG AS YOU OWN IT. We mean it when we say BUY IT ONCE and WEAR IT FOR A LIFETIME. &#x1F9E1; AT LIFETIME JEWELRY OUR GOAL IS TO PROVIDE JEWELRY THAT LOOKS AND FEELS LIKE SOLID GOLD AT A FRACTION OF THE COST. For over 30 years our family-run small business has stood for INTEGRITY, proudly creating jewelry "Made in the USA" with the HIGHEST QUALITY CRAFTSMANSHIP, MATERIALS AND CUSTOMER SUPPORT. We expect the best for our family so we give the best to yours. You will get TWO diffuser Lockets!30mm Sunflower and 30mm Tree of Life pattern diffusers with 22mm felt pads. Choose Two car diffusers to get more aroma. Not include essential oil. Premium 316L stainless steel material, smooth surface, strong magnetic closure, long lifetime. Come with 12 felt pads, different colors,felt pad size is 22mm in diameter, thickened pads, absorb essential oil easily. Our store provides 22mm replacement felt pads. Relieve your stress and keep alert when you drive. Aroma around you, bring you good mood. Minimize some smell you don't like. Use your favorate essential oil to enjoy your daily life, your trip. A convenient and simple air freshener for your car, small space, nice look. It is a great gift for yourself, your family or your friends. Packing includes: 2 lockets+12 different felt pads. Usage: Apply a few drops of your essential oil to one felt pad, put it inside the 30mm car locket. 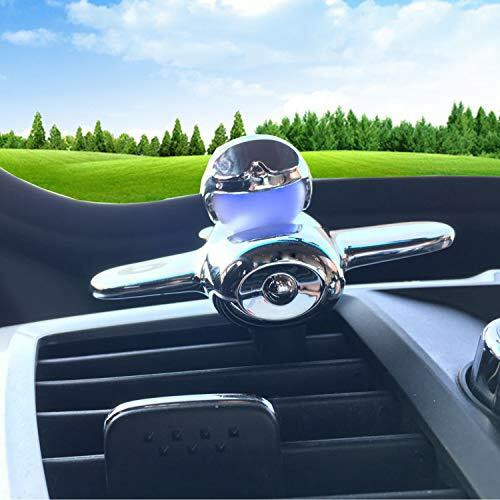 Easily to clip on car air-conditioning vent, place it on office desk, use it at home or any other proper places that you prefer. ♥Specification♥ -Floating locket pendant sizes: 30mm *30mm * 7mm, Diameter: 30mm, Inner diameter: 23mm, come with a 55cm/22" bead chain + 5cm/2" adjustable chain. since the lockets are closed by magnets, all you have to do is pop open the locket and fix the charms. 1928 Jewelry Gold-Tone Rotating Trio Locket Necklace, 30"
This lovely and unique piece is a must-have for the antique lover. 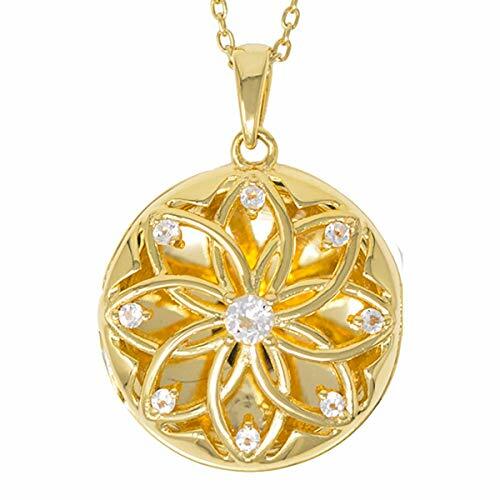 Beautifully designed three-sided rotating locket pendant. 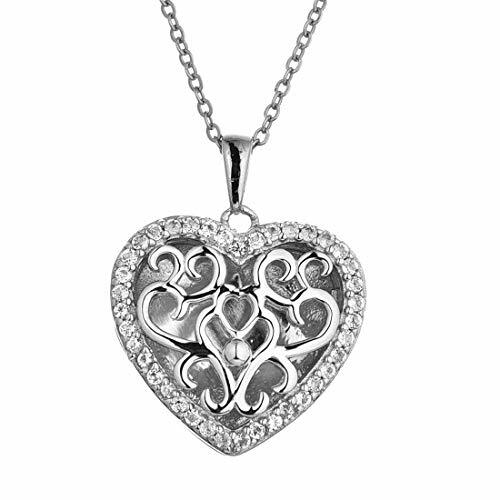 This breathtaking piece is the perfect way to keep memories close to your heart. 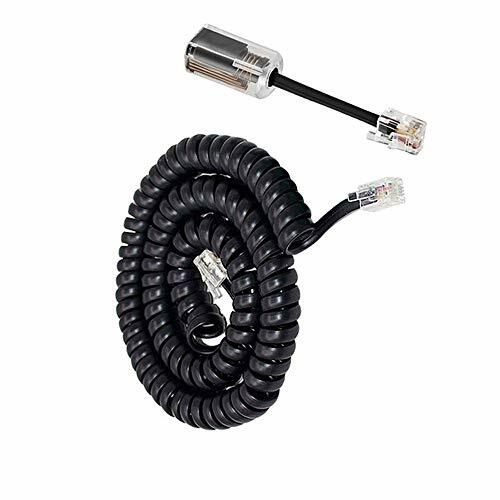 Handset Cords&Cord Detanglers: Uvital telephone cord detanglers applies to family or office fixed-line telephones which work with standard RJ9 telephone line, 4P4C gague handset coiled cord,such as Cisco phones. But NOT suitable for VOIP phone and RJ45 modular plug. Gold-plated Materials :The phone detangler use high-quality materials and gold-plated metal contacts to ensure great connection and sound quality. Use it to extends life of your phone cord and anti tangle phone cord. Easy to Use: Stop untangling twisted telephone cords. With an easy to install phone detangler twisted cords are a thing of the past. Simply snap the detangler between the telephone handset and the cord. Superior design uses an extended cable for compatibility with handsets that have recessed jacks. 360° Rotatable Anti-Tangle Cord: The Phone Cord Detangler automatically rotates 360 degrees to effectively prevent your coiled phone cord from being tangled and messed up, and you would not feel frustrated with entangled cord. Package Includes: 2 x Telphone Handset Cords, 2 x Cord Detanglers. TRUE WIRELESS SECURITY CAMERA: Powered by the rechargeable Lithium-ion battery, the camera is totally wire-free. Once fully charged, it can record for a whole month or up to 2,800 alert triggers. The included backup battery makes it easy to switch out for a seamless transition. ENHANCED NIGHT VISION: By adopting the SmartSens SC2310 CMOS Sensor and IR CUT filter, the wireless camera in this system provides enhanced night vision and colorful video views even under weak lighting conditions. Keep your home safe at night and don't miss any details. IP-65 WEATHER RESISTANT: With the IP-65 water-resistant design and 14°F to 122°F working temperature range, the Kami Wire-Free Camera can be installed indoors or outdoors. You can even place it in your yard, as long as it's within the range of the WiFi signal coverage. EASY INSTALLATION: There are 3 installation methods for the camera: 1. Magnetic base attached to a metal surface and hold the camera itself for flexible rotation; 2. Install the metal plate base (included) on the target place and attach the camera on it; 3. Install the support with 1/4" screw (not included) to the place you want and fix the camera body onto it. 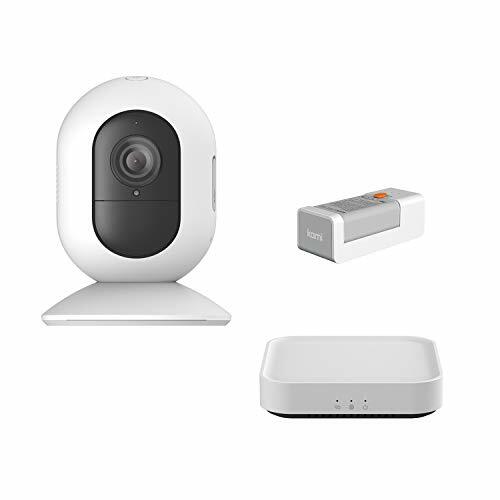 POWERFUL MODULAR SECURITY SYSTEM: The Kami Smart Security Base Station communicates with the camera and motion sensor. It's flexible, meaning that you can use up to 4 cameras and unlimited sensors (Kami Entry Sensor or the Kami Motion Sensor etc.) 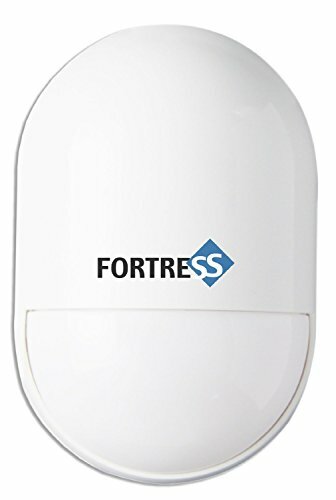 to complete your home security solution. You also receive 6 months of FREE cloud storage to help jumpstart the securing of your home. The free 10 second video will be stored on the Kami Cloud and you will receive a notification on your smartphone. Easy to Use:Stop untangling twisted telephone cords. With an easy to install phone detangler twisted cords are a thing of the past. Simply snap the detangler between the telephone handset and the cord. Superior design uses an extended cable for compatibility with handsets that have recessed jacks. 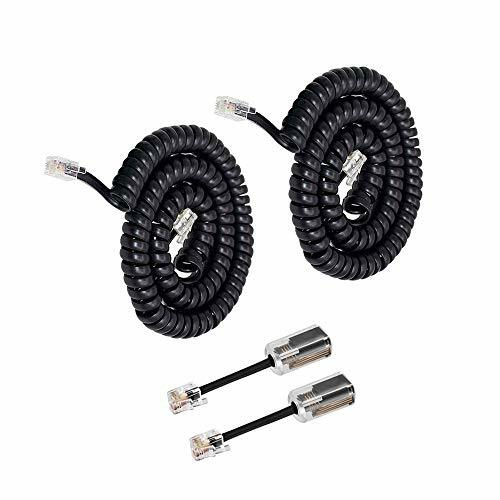 Package Includes:1 x Telephone Cord Detangler,1 x Telephone Handset Cord. 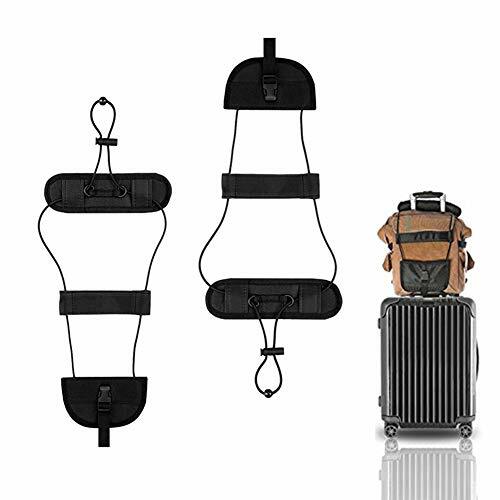 ✈PERFECT DESIGN --- The Luggage Bungee is adjustable and elastic strap, So it stretches easily around larger bags or you can tighten it to keep your hand luggage to be strapped securely to the handles of your wheeled suitcase, Without twisting or slipping. ✈DURABLE AND LIGHTWEIGHT --- Crafted with high quality microfiber material attached to the elastic strap and plastic locker clasp. Secure quick release buckle closure ensures security, The belt can be adjustable, and tied rope full of flexibility, Gentle stretch, Will not let you bag deformation. ✈EFFCIENT AND STABLE --- The Bag Bungee have two cords and the structural pieces that cross perpendicular to the cords, The whole bundle is a lot more stable, and giving you more maneuvering space and lets you move around with the utmost confidence. ✈EASY STORAGE AND CLEANING --- Compact and easily stores in a purse or carry on, providing a hassle free traveling experience. And Cleans easily with water and cloth and its machine washable. ✈MAKE TRAVEL EASY --- Set your hands free with this Bag Bungee! If you ever felt like you needed an extra hand around your luggage, buy this bag bungee and you will never feel overwhelmed or frustrated with the luggage when you're hurrying to catch your airplane.LIFETIME WARRANTY. 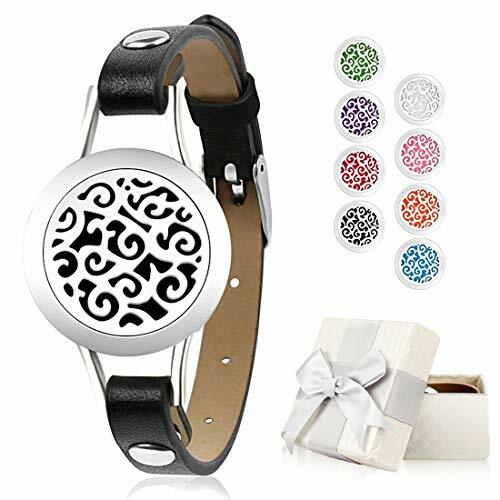 &#x1F451;【Relieves Tension and Stress】This is anxiety ease essential oil diffusing bracelet for women. You can drop your favorite essential oil or perfume on it to calms emotions,relieves tension and stress in daily busy work, driving, sleeping, long-distance travel, overseas business trips. &#x1F451;【Dainty and Feminine Bracelets】Add 2-3 drops of your favorite essential oil on the felt pad, this aromatherapy bracelet will make you surrounded by a charming and pleasantly aroma for a whole day.8pcs washable and reusable cotton pads with different colors can match any clothes. &#x1F451;【Perfect Gifts For Women】A special gift ideas gift with good design & purpose for aromatherapy fans and anyone who loves essential oil. It is a perfect birthday gift for women,can also as anniversary gifts,christian gifts,teacher gifts,friendship gifts, for girls,mom,kids,sister,aunt. Come with the beautiful premium-grade gift boxes you do no need extra packaging. &#x1F451;【Lightweight and Adjustable】The diffuser bracelet has five holes in the band to adjust size to fit your wrist. The minimum diameter is 1.65 in (4.2cm) and the maximum diameter is 2.36 in (6cm).Lightweight design makes you very comfortable to wear. 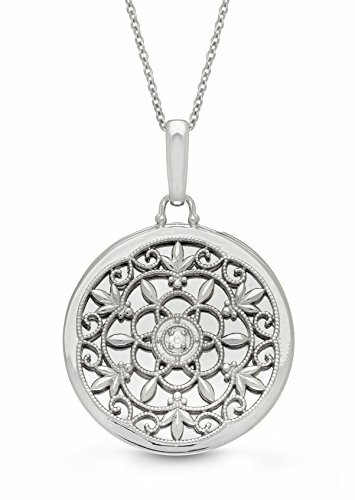 &#x1F451;【Hypoallergenic and Anti-Fading】The aromatherapy locket was made from hypo-allergenic surgical grade 316L stainless steel, no leaking and protect sensitive skin . And the band material is high quality soft leather, not easy to peel off and can keep luster for a long time. Three-color breathing light cool design, touch the head to start breathing, blinking follow the music. The music stops, Automatically enters hibernation. 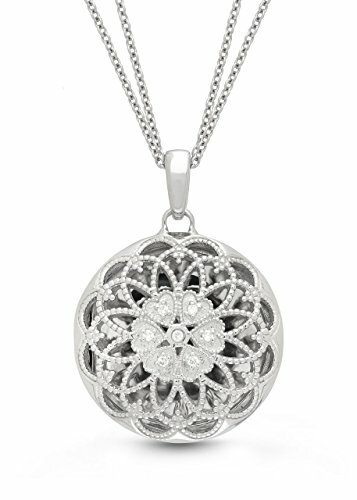 Car clip diffuser locket made from high quality alloy material for long life and durability. A piece of jewelry made to last a lifetime. Simply clip the Essential Oil Diffuser to a vent, and let it go to work. Remove the felt pad allow to dry and gently wipe with alcohol. Rinse the felt pad in cool water and your car diffuser is ready to use again. LED: Ringlike indicator, turning BLUE when working. BUILT-IN: Apple Certified 3.3 feet / 1.0 meter lightning cable. 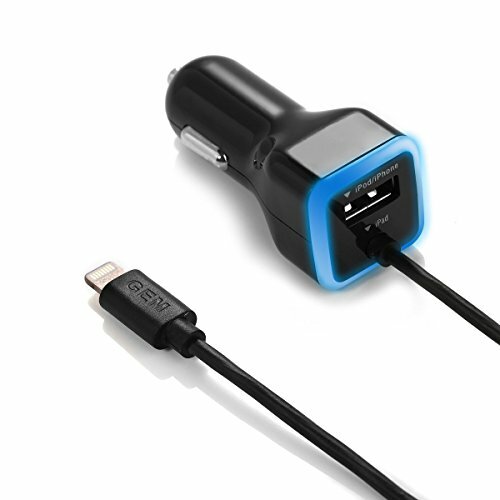 APPLE MFI CERTIFICATION: Ensures complete charge and sync compatibility with The 3.1A lightning Car Charger works with Apple devices that have a Lightning port, including the Apple iPhone Xs/XS Max/XR/X/8/7/6/Plus, iPad Pro/Air 2/Mini, 4 iPad (4th generation), iPod nano (7th generation), iPod touch iPhone X, 8, 8 Plus, iPhone 7, 7 Plus, iPhone 6S, iPhone 6s Plus, iPhone 5, iPhone 5C, iPhone 5S, iPad Air, and iPod Nano. Additional USB port works with all USB enabled devices. 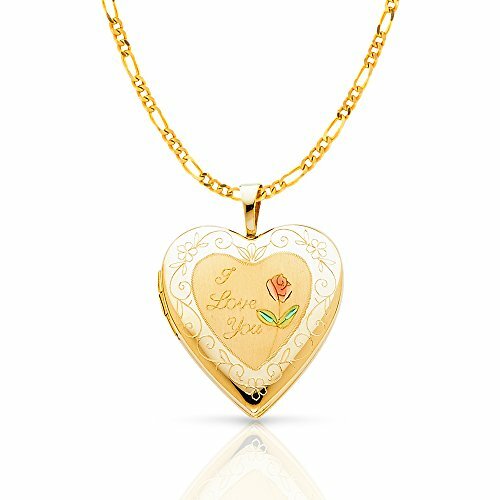 14K Yellow Gold Engraved Heart"I Love You" with Enamel Rose Flower Locket Charm Pendant with 2.3mm Figaro 3+1 Chain Necklace - 22"
✅ PREMIUM 14K GOLD: Our Jewelry is crafted from Durable High Quality Materials, Gems, and Stones; Hand-Stamped for Authenticity as well as FTC law Approved. Easy to polish Long Lasting Jewelry that won't permanently tarnish or rust! ✅ 100% SATISFACTION GUARANTEE WITH EASY RETURNS: Warranty you can Trust by our American Owned and Operated Ioka Jewelry company. Hassle-free, no questions asked return policy. 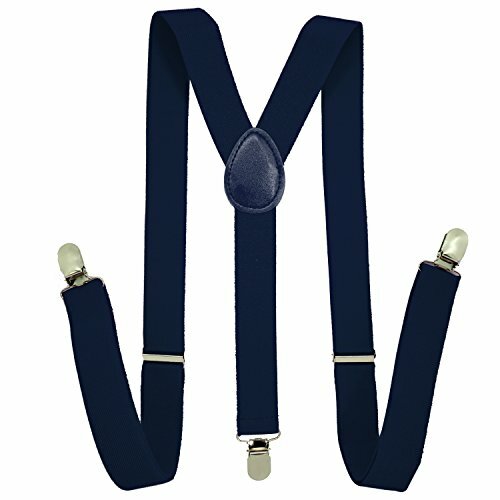 ✅LIGHTWEIGHT FOR MAX MOBILITY- Are you frustrated with suspenders for men that are cumbersome and heavy? With our suspenders, you can get as active and energetic as you like and the suspenders will go there with you. Attending lots of important business meetings? 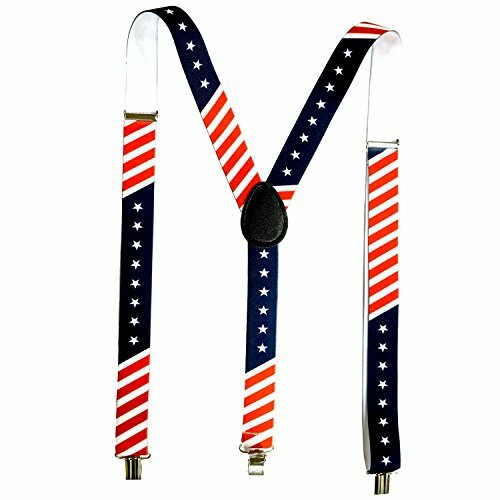 These suspenders embrace the man you are in every aspect and keep light so that all you feel is the comfortable sensation of your pants being held up. ✅STRETCHES TO FIT YOU- The flexible elastic woven fiber that makes up these suspenders will stretch no matter what activity you're engaged in. They have a good feel to them- it feels like you're lighter than ever before as your pants are no longer weighing you down. You can load up large pant pockets with your phone, keys, wallet, a bunch of change, protein bars, even rocks, and no matter how heavy they get these stretchy straps will buy you up and keep your pants up all day. ✅STRAPS NEVER LEAVE CUTS IN THE SKIN- These straps have soft edges, making it so that you can wear the suspenders however you like- even shirtless for outdoors activity where you're sweating a lot and you want your pants to stay up. No problem- these suspenders will never cut into your skin. They will only rest on top of your skin, leaving you intact, whole and comfortable. ✅ADJUST TO FIT YOU- It's so easy to adjust these suspender straps to fit you. With an adjustable back and front straps, you decide how stretched out you want the suspenders to be. You can adjust the straps up to 48 inches so that they fit you, in whatever body shape you have. We've tested them across dozens of men and they all say they enjoyed the flexibility these suspenders give them in choosing their fit. 14K GOLD GUARANTEED: 14K gold stamped 14K for authenticity , A beautiful classic and elegant design. 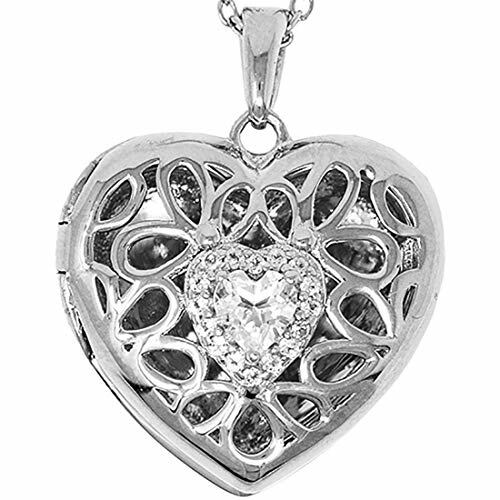 Styled by our top of the line designers in Italy , this Heart Locket will get you all the compliments. Free Branded Jewelry Pouch Included as well as a beautiful gift box. Perfect for sending a gift to a loved one. Velvet jewelry pouch keeps jewelry protected and scratch free. Also makes this perfect for gifting for your friend or loved one.